We arrived in Lashio yesterday after one hour forty minute flight north from Yangon. It is a city of 400,000 but doesn't have anything particular to commend it. We are to plan starting a school. There is a couple of acres , we plan to meet with the engineer today checking contours of the land. There is already teacher training under way here with two of our trainers repeating the training done earlier this year. Above is a photo of the water festival. It is a huge part of the Myanmar festive calendar. For four days the business close, Huge platforms and stages are built along the sides of the roads, and people with hoses drench everyone in the street. or throw buckets of water. All over the country this goes on for four days. It is a ritual cleansing of sin and at the end, they go to the temple to begin the New Year. no one is safe from the drenching, consequently we are well out of town when the festivities begin. As I mentioned this is a land of golden temples. 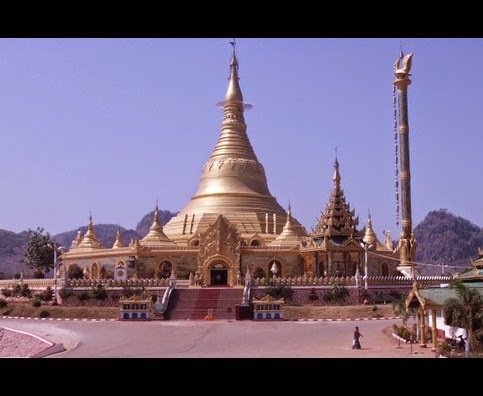 I was told yesterday, that a temple in Yangon has 73 tons of gold on the roof and in the ornamentation.